Do We Really Need Black Pepper to Absorb Turmeric? The most popular questions I’m asked in regards to turmeric is “Does your turmeric contain black pepper”? In fact, it has become such a big topic that turmeric is almost synonymous with black pepper. Even fellow colleagues and teachers, whom I have great respect for, have made a point to tell me (and teach in class) that I must have black pepper with my turmeric or I won’t receive the benefits. I’ve actually heard people say, and tell me point blank, if turmeric doesn’t have black pepper it won’t have any effect because you won’t absorb it. So why is everyone obsessed with adding black pepper to turmeric? Well the short-ish answer is, there was a study in 1998 where researchers observed the absorption and metabolism of curcumin (an active of turmeric) in humans and rats to determine the bioavailability of curcumin. The results showed that 2g of curcumin by itself was poorly absorbed in humans, although rats seem to absorb curcumin relatively well by itself. The human subjects (10 males aged 20 – 26) were then given 2g of curcumin with 20mg of piperine (an active molecule found in black pepper) and after 45 minutes, curcumin blood levels went from an average of 0.006mcg/mL to an average of 0.18mcg/mL. This equates to a 2000% (relative) or 30x (actual) increase in curcumin blood levels because of piperine. The rats went from an average of 0.83mcg/mL to an average of 1.70mcg/mL after about 15 minutes. This equates to just over 104% or 2x actual increase in curcumin blood levels. Statistically significant for rats, and clinically relevant for humans. This is the study everyone refers to when talking about turmeric and black pepper. The question is, how does that relate to you and your health? In order to answer this question, we need to understand the difference between turmeric and curcumin, and the difference between black pepper and piperine. Is Turmeric and black pepper the same as curcumin and piperine? The first thing to understand is that curcumin is not turmeric and piperine is not black pepper. It would be like comparing the difference between the benefits of eating a blueberry (as a whole food) to the benefits of eating vitamin C extracted from the blueberry. In this analogy the blueberry = turmeric and vitamin C = curcumin. While vitamin C is an important part of the blueberry, there are so many other powerful actives in blueberries that have health benefits, so you will have a completely different result if you eat whole blueberries compared to eating vitamin C extracted from blueberries. Similarly, there is a very big difference between taking turmeric, which is a whole food, and taking curcumin, which is a single molecule extracted from turmeric. This can be a little confusing to understand at first so here is breakdown of these ideas. Turmeric contains hundreds of different active molecules, one of which is curcumin, and black pepper also contains hundreds of active molecules, one of which is piperine. It is therefore impossible to trace which molecule is doing what in the body when eaten as a whole food because there are just too many combinations of active molecules when you take turmeric with black pepper. This is why most studies are on curcumin, not turmeric. It’s very difficult to isolate which active is having the biological effect in the body. Due to the nature of turmeric, that it contains hundreds of active molecules, the potential health benefits far outweigh the potential benefits of curcumin by itself. In fact, when curcumin is removed from turmeric, you still get the same benefits as curcumin. We know this because some researchers decided to remove the curcumin from turmeric and see what the benefits were, amazingly, curcumin-free turmeric exhibited many of the same biological activities as curcumin. Fascinating! It really makes you wonder if you should be spending your money on curcumin supplements which are far more expensive (and often less effective) than turmeric as a whole food. 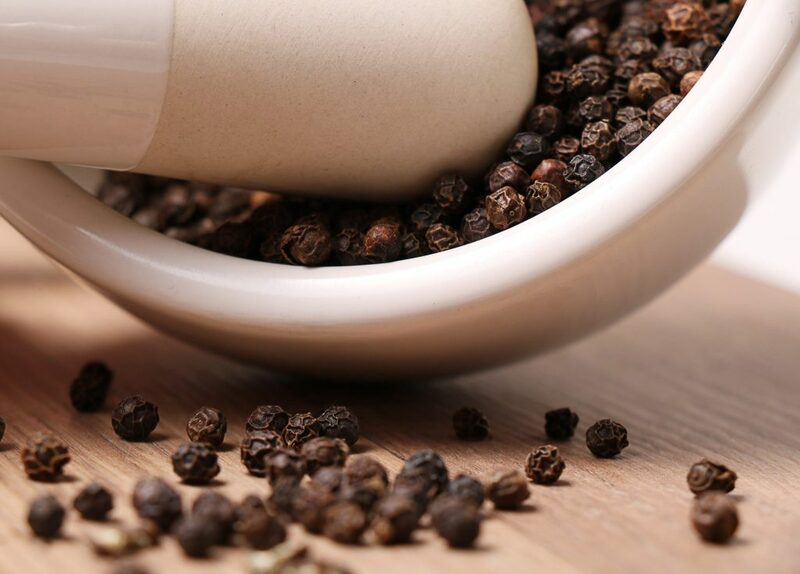 As mentioned earlier, there are many other actives in black pepper besides piperine and these other actives also have incredible activity, as has been shown in this study. The reason is due to the many actives contained within black pepper, including piperine. It should be noted however, that black pepper contains anywhere between 2-9% piperine which (at 9%) is very high for a single active in a food. Now, we know that piperine can significantly improve the blood levels of curcumin, but piperine in black pepper doesn’t just affect curcumin, it can (and does) affect the absorption and metabolism of hundreds (if not thousands) of different molecules, both natural and synthetic. Any molecule that is processed via P-glycoprotein or CYP3A4 enzyme will be affected by piperine. This means two things: 1) The piperine in black pepper will alter (its not always beneficial) the absorption and metabolism of other molecules as well as improving the absorption of many actives in turmeric and; 2) You should be careful when combining any pharmaceutical medication with black pepper or any supplements that contain black pepper or piperine. A very important point to understand with turmeric is that the naturally occurring molecules in turmeric actually help each other to absorb and metabolize. So in other words, turmeric by itself, with nothing added, absorbs quite well because of the synergism of the molecules contained within turmeric. More specifically, the volatile oils naturally contained within turmeric significantly improve the absorption of other molecules in turmeric (such as curcumin) which has been shown in the research. An example is found in a study where turmerone, one of the main volatile oils contained within turmeric, significantly increased the absorption of curcumin by human intestinal cells. But this is not the only example. Some researchers investigated the effects of curcumin with piperine VS curcumin with turmeric essential oils and found that curcumin with turmeric essential oils to be slightly more effective for treating depression than curcumin with piperine. This is very interesting considering that piperine increases absorption of curcumin by up to 30x as discussed earlier. Furthermore, research has shown that the naturally occurring oils in turmeric improve the anti-inflammatory effect of curcumin. But it actually gets better. Evidence shows that the essential oils naturally contained in turmeric, not only improve absorption of turmeric, but have their own biological effects such as antioxidant, anti-inflammatory and neural stem cell proliferation activity. When you take a curcumin supplement, it usually doesn’t contain the essential oils naturally found in turmeric, not to mention the other hundreds of actives. Does this mean we don’t need to use black pepper with our turmeric? In a word, yes. You don’t need black pepper to absorb turmeric. There is no harm in adding black pepper to your turmeric, in fact the evidence shows it will help to metabolise many of the actives contained within turmeric or any other food for that matter. But the truth is you don’t need it to absorb the molecules contained within turmeric, including curcumin. The main difference is that turmeric with black pepper will most likely absorb faster than turmeric by itself and may stay in the blood stream longer. This isn’t good or bad, it just depends on what you’re taking the turmeric for. For some conditions, like gastrointestinal ulcers for example, you may want the turmeric to stay in your digestive tract longer. A study using turmeric powder (not curcumin) for duodenal and gastric ulcers showed some very impressive results. After 8 weeks of taking 600mg of encapsulated turmeric (5 times daily), 18 of 25 people had complete absence of their ulcers. There is also the traditional use of turmeric in Ayurveda (East Indian medicine) where turmeric powder is mixed with cow’s milk, ghee and black pepper. This combination has been used for many hundreds, possibly thousands, of years in India for a range of different illnesses, and is firmly a part of their cultural medicine. The fact that turmeric was traditionally prepared this way (with black pepper), is reason enough to consider taking black pepper with your turmeric, due to the holistic effect of this combination on the body and the synergistic effects of black pepper, fat (oil) and turmeric. The scientific world is slowly building evidence to support this formulation and to also explain the reasons why it is beneficial. We are all unique, and this includes our biology. What works for one person, doesn’t always work for someone else. Our bodies can vary significantly when it comes to how we absorb and metabolise different foods or medications. Some people have very strong effects when taking a particular herb or drug, while others experience a mild effect, and may need more of that very same medication to achieve the same results biologically. Of course, you also have those who respond negatively to that drug or herb. Generally though, most people will respond in a similar fashion and so for the majority of people, it is common to make generalisations, particularly in herbal medicine. When it comes to taking turmeric without black pepper, there are many reports about its efficacy. This is true not only from the feedback we have from our customers, but also from people all over the world. Read a few forums or comments on blog posts and you will quickly see that many people do experience strong results from taking turmeric, however often times people are not specific in what they are taking (turmeric, curcumin or a specific brand, the dose, for how long, etc) so it can be very difficult to get an accurate assessment. This anecdotal information is still evidence, but it not as reliable as controlled trials, and requires a lot more work to verify what is real and what is marketing or exaggerated. We’ve been in the turmeric business for over 5 years now and we still have many customers using our ORIGINAL product (no black pepper) with good results. These are people who are using it for very specific health issues (most often pain/inflammation) not just for ‘general health’. In fact, I personally still use the ORIGINAL product because my body does not respond well to black pepper, and it works very well for me. One sign that what you’re eating is not being absorbed or metabolised effectively, is when your stool or urine becomes the same colour as what you’re eating. For example, there is a condition called beeturia, which occurs when the red pigments in beetroots are not metabolised effectively and a person’s urine and stool have a very obvious red tinge. The same thing can happen with curcumin but has only been observed at very high doses of 8,000mg (8 grams) and above. The big difference between beetroot and curcumin is that beetroot is a whole food and it is only the red pigment that is not being metabolised while the rest of the beetroot is metabolised. Curcumin, however is a single molecule (more accurately a combination of 3 molecules collectively known as curcuminoids) and is what makes turmeric yellow. Most people don’t experience yellow stool, even when taking curcumin (the yellow pigment of turmeric) at high dose, what to speak of turmeric, which is between 3-8% curcumin. There are currently no controlled trials that show yellow stools as a side effect of turmeric intake. Not having yellow stools is not necessarily evidence that you’re absorbing all the turmeric, but it does suggest that by the time it has reached your large intestine, you’ve absorbed at the very least, a large portion of the turmeric you’ve ingested. If you do begin to experience yellowing of stools from taking turmeric, then this could be a sign of something much more serious with your digestive system, and you should visit your local GP to get a check-up. Most likely, you will have other symptoms, such as abdominal pain, bloating, diarrhoea, blood in the stool and so on. Most people don’t have a problem with black pepper and can easily add it to food or take it with supplements. However, some people do have issues with black pepper and can experience symptoms like diarrhoea, stomach cramps, rashes (usually from direct skin contact), coughing and feeling lightheaded. More severe symptoms may include swelling of the face, tongue or lips, vomiting, nausea, asthma and anaphylaxis. Severe symptoms are rare, but there was a reported case where a 17 month old boy experienced facial swelling and a severe cough from ingesting cayenne and black pepper. Ginger allergies are also quite rare, although there is anecdotal reports of people who cannot eat ginger due to allergy symptoms such as swelling of the lips or tongue, itching of the mouth, eyes or throat and developing hives or a rash. For this reason, our ORIGINAL turmeric product is well suited. It is very difficult to find an encapsulated turmeric without black pepper or some other added herb to aid with digestion/absorption. But for the reasons described in this article, we still sell our ORIGINAL turmeric capsules. If you like, you can try them for yourself. Thank you for giving a detailed explanation on this topic. This is exactly what I was looking for. Great article! This was just the info I was looking for. The article was clear, concise and to the point. Thank you! Thank for the valuable info.